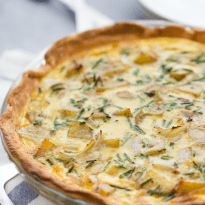 My Grandma June was proud of her Irish heritage and I know she would approve of this simple brunch recipe for Bacon and Potato Quiche! She passed away in 2012 and I think of her every day. I really miss her! Grandma June loved her meat and potatoes. You pretty much knew when you went to her house that potatoes would probably be on the menu. And beef. Grandma June’s life partner, Clarence, was (and still is) a beef farmer. She had a freezer stocked full of beef from his farm. Though this recipe doesn’t include beef, it does have one of her favourite veggies. I normally make frittatas, but had some Pillsbury refrigerated pie crust to use up so quiche it is. The filling was delicious – creamy, cheesy and fragrant from the fresh herbs. John didn’t care for the crust too much so I might turn it into the frittata when I make it again. I liked the crust and thought it was delicious. He’s picky picky. Try this recipe for a St. Patrick’s day brunch – maybe serve with some potato bread to complete the meal! Check out these 14 traditional Irish dishes for some more suitable suggestions. You might also like this Hamburger Quiche. Are you planning anything special for St. Patrick’s day this year? Perfect for a St. Patrick’s day brunch! A creamy, cheesy filling packed with hearty potatoes, bacon and fresh herbs. Preheat oven to 450F. Line a 9 inch pie plate with refrigerated pie crust, pressing to fit. Prick the bottom with a fork. Bake for 8 to 10 minutes, until lightly golden. Cook bacon over medium heat until crisp. Scoop bacon onto a paper towel lined plate. Drain grease, leaving about 1 tbsp in the skillet. Add onions, potatoes and thyme to skillet and cook for 10 minutes on medium heat, stirring occasionally. In a medium sized bowl, whisk half and half, eggs and salt and pepper. Set aside. Spread cheddar cheese on the bottom of the pie crust. Top with bacon and veggie mixture. Pour in egg mixture and top with chives. Place pie plate on a baking sheet and bake in a 375F preheated oven for 35 to 40 minutes or until filling is set. Let stand a few minutes before serving. This looks delicious.I think it would be great for brunch! This Bacon and Potato Quiche looks so delicious and I want to make it with my St. Patrick’s Day Corned beef and cabbage. Thanks for an easy recipe! I am going to save this recipe to pinterest, and make it for St. Patrick’s Day. I like easy recipes like this one and it looks so pretty and delicious! This would make a great dinner, too! Salad on the side and you’re good to go! This recipe for Potato and Bacon Quiche sounds delicious and simple to make. I hope to make it some weekend and enjoy it with the rest of my family. Thank you for such a plain, yet delicious, recipe. I just pinned this recipe, I so miss having quiche. I don’t know why we don’t make it more often, it only seems to be Christmas when we make them. IT’s the combo of bacon and potato that totally caught my eye! This recipe has everything in it that my husband would love to eat. I definitely will try it. Thanks. I love Quiche and this looks very good. I haven’t had Quiche in such a long time I think its soon time to try this. Thanks for sharing. I love quiche but I have never made one with potatoes in it. I think I will give this a try. I love everything about this quiche. Great flavors. I’ll be making corned beef & cabbage and potatoes for St. Patrick’s Day. I haven’t had a quiche in a very long time. This looks absolutely delicious! Wowww,… yummyy…. i really love potatoes…. thanks for sharing about recipe! Looks delicious and easy to. Make. Not much of a quiche person. This looks like something I might enjoy. Will try. I love quiche! Pair it with a salad and you have a great lunch or dinner. 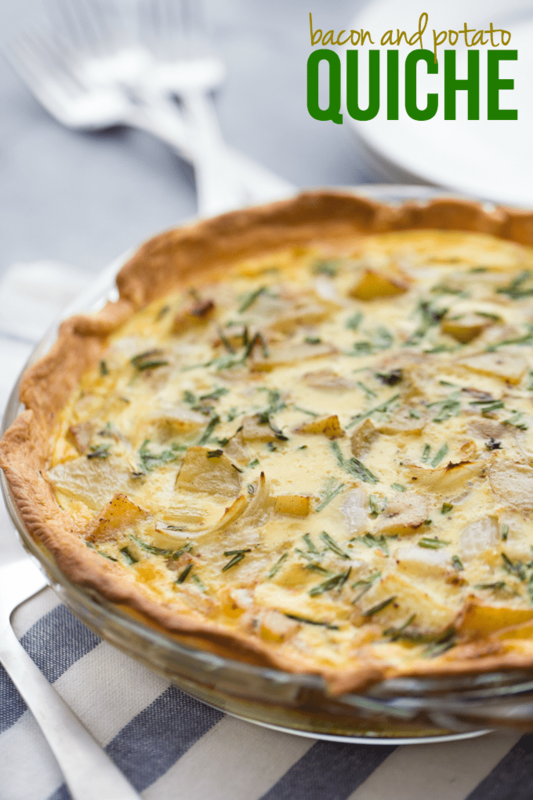 I’ve never tried potatoes in a quiche but this recipe looks so good I’ll have to try it. The crust looks especially good! I love quiche. My mom always made it when I was a child. This sounds really good. I would like to try this, it looks so delightful. Thanks for the awesome recipe, I will be trying it towards the weekend. I love quiche! It’s the perfect, delicious and easy meal and so very versatile! I will have to try this without the bacon though. Thanks! This actually sounds quite good. Looks really good too. Thanks so much for sharing. Bacon and potatoes sounds like the perfect ingredients for a dish I’d like to make! Thanks for this recipe, I can’t wait to try it out! I love quiche, I normally make a breakfast quiche once every three weeks though but yours with all the herbs esp the thyme looks amazing. Yum! I love quiche and this one is packed with favorite goodies….like, bacon!! Nothin’ wrong in the world with some meat and potatoes. Your grandmother was a wise woman 😉 And I’m sure she’d be proud you are sharing this delicious recipe! I’m a potato lover through and through and well, bacon makes everything better, so this pretty much looks fantastic! Yummmmmmmmy!! I love quiche – pinning this one to try for sure!! Mmmmh yes, that’s what I like! Thanks for the recipe! Yum, bacon and potato make such a great combination. This is a great quiche, I don’t make quiche often enough. Thanks for sharing with Small Victories Sunday Linkup. Pinned to our linkup board and sharing on my blog FB page. I love quiches and this one looks absolutely delicious! Potatoes in quiche is such an underrated thing, I feel like! Your Quiche looks delicious! Hope you have a very special week and thanks so much for sharing with Full Plate Thursday. We love quiche; in fact I just made a spinach and cheddar cheese one today. We’ll have to try this one another day. It looks do good. Sounds good, never thought about putting potatoes in a quiche but it would definitely work. Hubby would like this! I haven’t made a quiche in a very long time but I suppose I would still be able to pull one off.This looks to be very tasty. I’m serving a large group for lunch. Could this be baked a day in advance and warmed before serving? Yes, I’m sure that would be fine! Made this tonight for a test and it turned out great! I am making one for my moms group in tthe am. My hubby loves potato and i’m going to surprise him in the morning with the dish,thanks so much !! !